Fencing is a modern Olympic sport derived from the art of sword fighting. It is a fun and challenging activity for people of all ages. The wealth of different strategies possible allow people of all shapes, sizes, and abilities to compete. Although the sport has its origins and tradition in Europe, it is growing in popularity here in the United States. The epee is a a thrusting weapon. Only hits scored with the tip of the weapon are counted. The epee has a large, round guard to protect the fencer's hand. The blade, the largest of the three weapons, has a triangular cross section. The epee is derived from the dueling sword where the object was to draw first blood. In epee, the entire body- head to toe- is valid target. 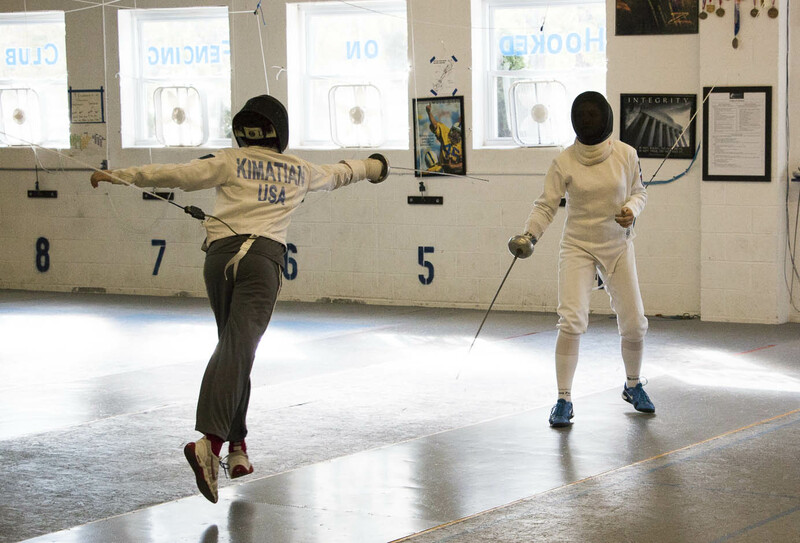 In epee, the first person to touch their opponent scores. If both fencers are touched simultaneously, both fencers score. Epee contains a lot of strategy, and each fencer stalks their opponent waiting for the right opportunity. This is usually followed by a quick attack and/or counterattack. Also called saber, the weapon is extremely light and hits may be scored not only with the fore-edge, but with the top third of the back edge and the point. As in foil, the "right-of-way" rules apply to determine who acquires the touch. Hits are scored on the opponent's body above the waist, arm and head count as valid. As with all sports activities, some risk for occasional injury exists. Usually these injuries are pretty minor - sprains, muscle pulls, etc - and the more you practice safe conduct at the club, the less the chance for injury. A study of injuries occurring in the 2008 Olympics, it ranked fencing as having one of the lowest injury rates, making it one of the safest Olympic sports. There were only 5 Olympic sports with a lower injury rates than fencing. Those were diving, synchronized swimming, rowing, kayak, and sailing. All water based sports.